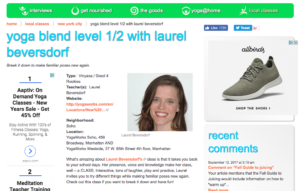 What’s amazing about Laurel Beversdorf’s class is that it takes you back to your school days. Her presence, voice and knowledge make her class, well – a CLASS. Interactive, tons of laughter, play and practice, Laurel invites you to try different things while making familiar poses new again. Check out this class if you want to break it down and have fun!